Mohd. Rafi (born 24th December 1924) in Kotla Sultan Singh, Amritsar, in a middle class Muslim family. 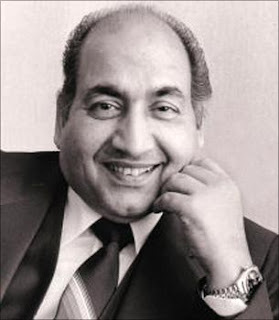 His elder brother, Janab Hamid Sahab, was the first to take notice of the divine gift in Rafi’s voice. He decided to concentrate all his efforts in providing all the support needed by his brother to make it big in the music world. At the age of seven, Rafi learnt Hindustani Classical music under the renowned Ustaad Bade Gulam Ali Khan and Vahida Khan. Mohd Rafi started his career at the age of 20, with a punjabi song, Soniye Hiriye, teri yaad ne bahut sataya for the movie Gul Baloch, which was released on 28th February, 1944. Many of his songs were sung by youths and school-going kids. Rafi was invited by Nasir, a well-known actor of those times to Bombay. From this point, there was no turning back. 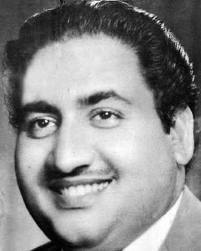 Rafi sang for Shamji Sundarji’s production Gaon Ki Gori. K.L.Saigal & Pandit Paulsikar had no words for Rafi’s praise. When Mahatma Gandhi was assassinated, Rafi sang a song Suno Suno Ay Duniya Walon, Bapu ki Yeh Amar kahani written by Rajinder Krishan and music by Hunslal Bhagatram. Rafi Sahab received the National Rajat Kamal Award from President Sanjiva Reddy for his song ‘Kya Hua Tera Vaada’ in the film ‘Hum Kissise Kum Nahin’ in 1977. Rafi used to sing pops, qawalli, bhajan, ghazal, romantic, rock’n'roll, light music, slow numbers, sad song, parody, fast numbers, almost anything. Government in 1965 with the prestigious PadmaShree Award. With the start of the famous Binaca Geet Mala in 1952, the program aired the immortal songs of the film Baiju Bawra and this really launched Rafi as a popular singer for all ages. Thousands of request for Rafi’s songs poured into Sri Lanka Radio. If he stylised his voice for the Dev Anand’s mannerisms, he took the job of instilling emotions in deadpans Suhani Raat Dal Chukhi in Dulari. It would not be an exaggeration to say that actors like Shammi Kapoor owe their career to this little man with the Voice of God. Rafi did not imitate any one nor did he stop any one from imitating him.Through out his carreer Rafi has not been accused of anything. Nor did he stop any new singer from taking his position. Now, Rafi is not amongst us, but that divine voice and soul will never fade from this earth. He was, and remains, a major force in film music, the music of love, despair, hope, humor…etc. Rafi’s voice had the healing capability. His music is calm, raging,deep, beautiful. It is the manifestation of the goodness and the divine. An article in Times of India, published on 24 July 2010 sums up his voice as, "If there are 101 ways of saying "I love you" in a song, Mohammed Rafi knew them all.The awkwardness of puppy love, the friskiness of teen romance, the philosophy of unrequited love and the anguish of heartbreak - he could explore every crevice of ardour. It wasn't just love, his voice could capture the navras of life - a failed poet's melancholy, a fiery unionist's vim, a debt-ridden farmer's despair, really anybody at all. Rafi, whose career spanned nearly four decades, was a singer for every season and every reason." In a reality show X-factor in india, Shreya Ghoshal said "If god would have voice then that would have been in the form of Mohd Rafi's voice." 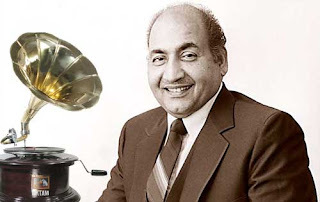 listen to mohd rafi's songs here..
mohammed Rafi sahab's database containing his 3537 songs. here..